One of our most favorite times of the year is when we do our annual Toy Drive for the children of Mary’s Place. Every year we collect toys at our four café locations. We then get the wonderful opportunity to go to Mary’s Place and actually help in handing out the toys to the children during the Mary’s Place Holiday celebration. You can join us in helping by donating a toy or book into the donation box at any of our Georgetown, Wallingford, Madison Park or Bellevue Café locations. When you make a donation to our Toy Drive, we’ll give you a dollar off your café purchase. Mary’s place is a non-profit organization that empowers homeless women and children to reclaim their lives by providing shelter, nourishment, resources, healing and hope in a safe community.Mary’s Place is an agency that provides homeless women and their children rescue, respite, nutrition, safety and shelter in a setting where relationships are affirmed, love and hope are discovered and a new future begins. In response to the increasing numbers of homeless families, in 2012-2013 Mary’s Place opened three new family night shelter programs and expanded services for children and families at our Day Center. Mary’s Place is only the shelter in King County that accepts homeless women with children. It is unique in that it empowers women to take control of their lives by first providing for basic needs such as hygiene, shelter, food, and clothing; and then by giving them access to tools, information, support groups and resources to find employment, housing, medical and/or financial services. Mary’s Place gives women life-changing hope by providing the love and acceptance of a caring community of women. All donations are greatly appreciated and will go to a child in need this holiday! Last day for donation drop off is DECEMBER 23rd at 3pm. 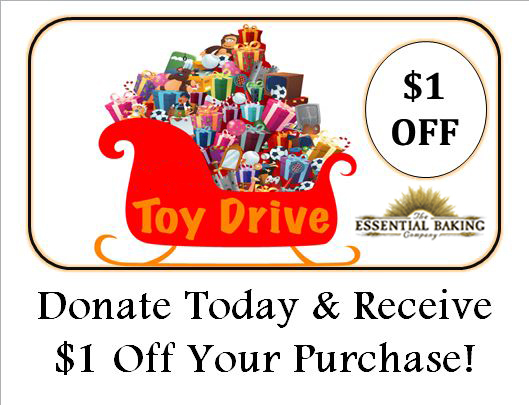 Customers who donate a toy will receive $1 off their café purchase!